“The last time I visited Baja, it was 1972. I was 18 years old and on a road trip from Rapid City, South Dakota, to Cabo San Lucas, Mexico. There were five of us in a four-seater Jeep with a spare tire on the roof. I was the youngest, so they gave me the ‘fifth seat,’ perched on that spare tire. For four weeks and the length of the Baja Peninsula, I sat cross-legged, hanging on for dear life as we bounced along the unpaved roads. The entire desert sprawled out on every side of me, empty and vast and so damn hot. It was breathtaking. It was humbling. It was probably really dangerous, and I wondered how long it would take them to notice if I fell off. When we finally made it to Cabo, we found a tiny, dusty fishing village with way more boat traffic than car traffic. We slept on beaches for a month. Then we turned around and drove back. The 18-year-old in that story was my father. Growing up, that was a tale my sister and I heard often. The details swelled and condensed over the years, but the sentiment was always the same. We have to get back to Baja. Like parts of the Caribbean, every passage provided line-of-site navigation. Unlike parts of the Caribbean, there were no bars, no spots to re-provision, no mooring balls, no cell phone service and often, no signs of civilization. Sailing in the Sea of Cortez was sailing off the grid, and it was fantastically picturesque. No charter vacation is without its challenges, and lucky for us, we met the majority of our challenges early. After provisioning and prepping the boat, we motored a short 45 minutes to Caleta Lobos, one of many anchorages that dot the La Paz peninsula going north. It was an easy trip and a spectacular sunset. We entered the anchorage in a northerly, so set our anchor in the northern of the two lobes. Night fell and—as it has a tendency to do when you least want it—the breeze shifted to the west, kicked up, and generated a nasty onslaught of waves, leaving us to slumber through a rollercoaster ride. The only thing worse than the motion was the nerve-wracking creaking of the snubber as it rubbed against the hulls, sounding as though it might snap. That was our crash course in “Coromuels,” a pervasive wind condition in the region. 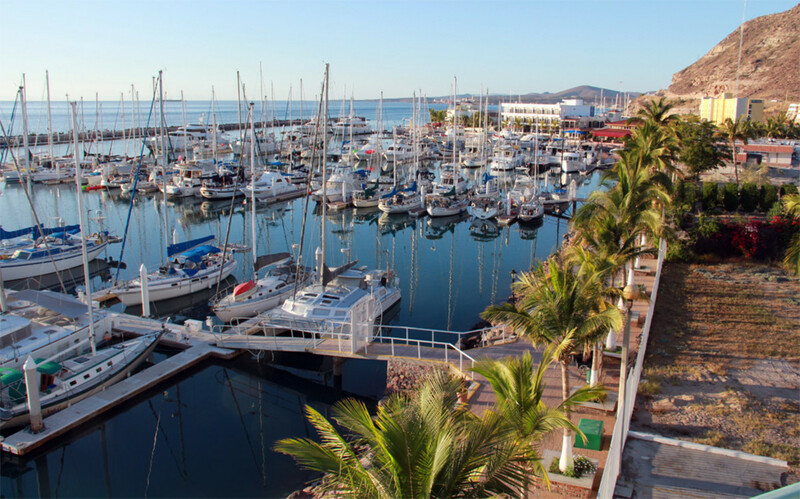 The Sea of Cortez is separated from the Pacific Ocean by the Baja Peninsula with its massive Sierra de la Gigante mountain range. Regularly, the cold air over the Pacific Ocean is sucked across the warm Baja Peninsula, speeds up, rips through the mountainous valleys and cranks onto the sea. We, regrettably, were completely exposed to a Coromuel all night. To add insult to injury, our morning attempts at making coffee were foiled when we discovered we were missing the crescent wrench necessary to switch from the empty propane tank to the full one. It took the good folks at the charter base four hours to bring us a new one, and it took my father and me all of our might to translate their instructions. I wished I’d studied my boat vocabulary. Finally, repair made, we were under sail heading for Caleta Partida on Espiritu Santo. 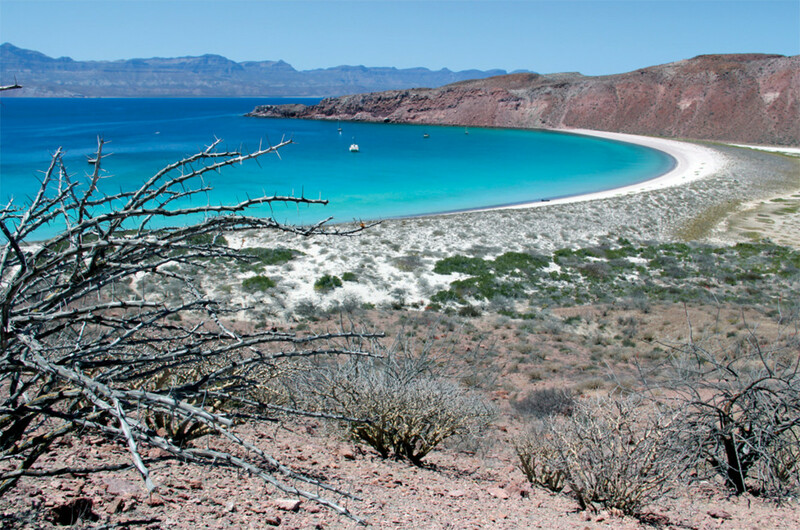 The island of Espiritu Santo is a natural preserve just 21 miles north of La Paz, dotted with beautiful anchorages and challenging hiking trails. We anchored on the north side and dinghied ashore to a trailhead called “El Rincon,” or “The Nook.” The guidebook called this a “hike,” but I would classify it as a “scramble.” The terrain was tricky, but the flora was remarkable. Dozens of varieties of cacti, trees and shrubs gripped their roots to the dry red rock, struggling to extract moisture from the arid landscape. Unlike that cacti, we weren’t built to stave off dehydration, and we eventually bailed on the hike in favor of water back on board. This is the desert, though, where the extreme heat of the day is matched by the surprising chill of the night. As soon as the sun dipped down behind the Sierras, the Coromuels kicked in and the temperatures dropped. We were a bit exposed and had another rolly night, but on the bright side, the holding was fantastic. Just about every night, it blew, and we swung, but never once did we drag. With two rough nights’ sleep behind us, it was time for our luck to turn. 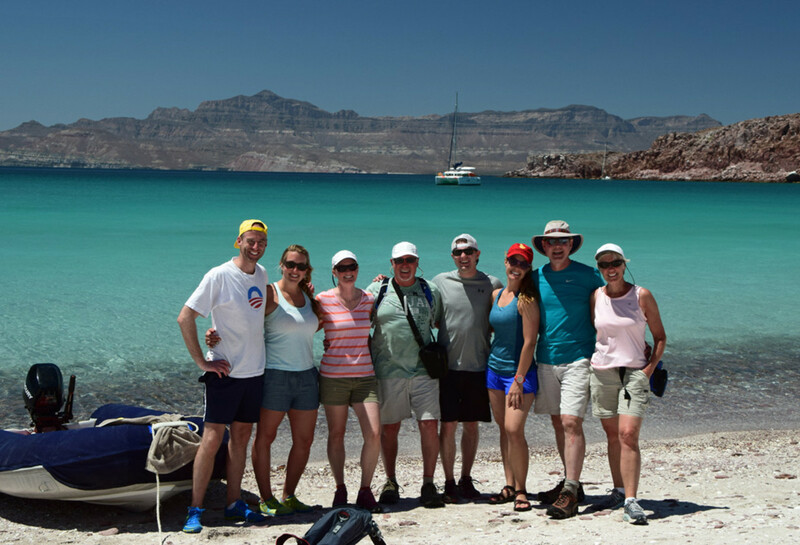 Our next stop was Los Islotes, a sea lion rookery on a rocky outcropping just north of Espiritu Santo. There, hundreds of sea lions lounge on the rocks and play in the shallow water. Humans, too, swim safely with these mischievous creatures, who turned out to be surprisingly interactive. One of my crew got nose-to-nose with a smaller one, and I swear I saw two sea lions holding flippers. In addition to the larger mammals, the fish were incredible. We swam through an underwater cave and discovered a dense and diverse population of fish. By noon, the rookery was filling up with tour boats from La Paz, so we sailed on for Isla de San Francisco. This little 900-acre island was pure Baja magic. There are two anchorages here—one on the west with a brilliant white sand beach and the other on the east with brilliant protection from the Coromuels, where we spent two nights. On the first, the “youngsters” went for a sunset kayak around the southern end of the island. Though we only meant to go a short distance, the view kept tempting us onward. Each time we rounded another corner, the sun set a bit deeper behind the Sierras, creating an increasingly radiant silhouette of golden sun, red mountains, amber water. The stillness of the water was broken only by our paddles, a leaping ray and a dozen crabs scurrying ashore. Next morning, we sailed to the western anchorage and dinghied ashore to hike the ridgeline of Isla de San Francisco. The hill didn’t look like much from the anchorage, but the steeply rising knife’s edge trail was tough. At the top, the red sand fell steeply on either side into the bright blue-green sea below. This was not a trek for the faint of heart, but the views were well worth the journey. By now, we had eased into the routine of a great vacation: wake, coffee, swim, sail, explore, read, nap, cocktail, dinner, stargaze. The two generations of crew were getting along beautifully, and every crewmember was finding his or her own special role. First mate Elinor was my right-hand-woman; she also celebrated her 30th birthday on this trip. Our boyfriends, Doug and Brendan, brandished their youthful muscles and were lots of help when it came to the requisite hauling and heaving on board. My mom, Julie, and her friend Hillary were our adventure leaders, always excited to go on another kayak/swim/hike, while their husbands, Mark and Mark, were our essential bartenders. They invented a new drink called the Man Overboard. I’d give you the recipe, but it changed every night. We were far from civilization and getting farther. The next stop was Bahia Amortajada, a mangrove oasis plopped down amidst this expansive desert. Where the other islands were hardpack and cacti, Amortajada was green leaves, jumping fish and squawking birds. From the dinghy, we witnessed egrets, herons, vultures and spoonbills. (I swear I also saw a 5ft-tall indigo flamingo, but my crew says the heat was getting to me.) On the far side of the mangroves, we reached a barren beach abutting a cactus forest. A dolphin carcass had washed ashore, and the imposing cacti stood as sentry as far as the eye could see. The scene was harsh and intense, and yet, as we traveled back through the mangroves, life was abundant. It had been six full days since we’d interacted with other humans, and we figured it was time to do so again, lest we forgot how to do it. We sailed farther north still to the village of San Evaristo. The breeze was fantastic—12 knots right on our port beam. My father told me that San Evaristo reminded him of the Baja of his childhood. Most of the locals were fishermen, and there was a pleasant, slow pace of things. A single dog wandered along the beach and seemed to belong to everyone and no one. The locals were laid-back and kind. I could get used to this place. Having reached our farthest point north, it was time to sail back south again. 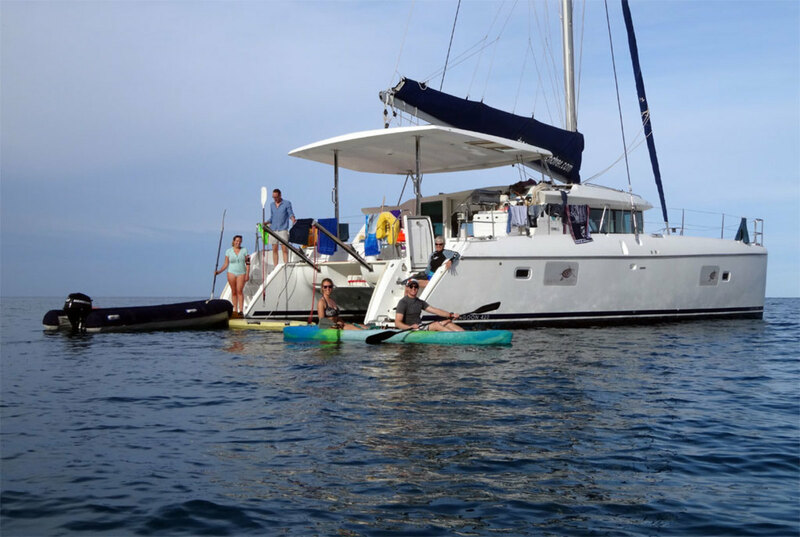 But because sailing vacations are rarely without excitement, we were met with yet another challenge. This time, it was the water. Because everyone knows “don’t drink the water!” we had provisioned enough water for drinking and cooking; the four tanks on board were for showers and dishes. Six days in we had depleted one of the four tanks and switched over to the next. Out of the faucet came…nothing. My dad’s friend Mark knows about plumbing from his time spent on power boats, and he tried everything—pumping, priming, sucking, blowing and whispering sweet mechanical voodoo at the thing—all to no avail. We even called the base using the breath of cell service available in San Evaristo. Hours in, we determined a repair to be impossible. The options were presented: wait a full day for help to arrive or make a boat-wide pact not to shower. It was in that moment that I learned I had the right friends aboard. Without skipping a beat, we all agreed to stop showering and get on with our adventure. And it was back to the Sea of Cortez. As if to reward us for our trouble, the wind gods stirred up an ideal breeze to propel us to our next anchorage. It was 25 nautical miles to the south and east, and we were riding a brilliant westerly in the mid- to high-teens. Three hours and three gybes later we pulled into Ensenada Grande in time for a round of Man Overboards. This three-lobe anchorage is tucked far into Isla Partida (the northern half of Espiritu Santo) and the views are astounding. This was our last night on anchor so, like the responsible seafarers we are, we finished the tequila. Our final day was perfect. We swam, kayaked and paddleboarded in the aquamarine water. We dinghied ashore for a wonderful four-mile hike that climbed a well-marked path to a plateau overlooking the Sea. We ate well, we slept well, we didn’t shower and we didn’t mind. The next morning, tidying up the boat back in La Paz, I asked my Dad what he thought—if the trip had lived up to his expectations, and if it had scratched his itch to return to the place that held so many memories for him. Learn the Language: In La Paz, you will be able to find English-speakers, but once you sail north, they are few and far between. Brush up on your Spanish and bring a pocket dictionary. Pay special attention to vocabulary describing boats, sailing and repairs. Provision with care: You have one and only one opportunity to provision for the whole trip, and that is in La Paz prior to casting off. Ramon at Dream Yacht Charter will steer you to the right super-mercados. Be sure to provision carefully and thoroughly. Carry a huge amount of bottled water. You’re in the Mexican desert. We packed 1 gallon per person per day of bottled water and had only 3 liters left when we returned to port. And it gets even hotter after March. Prepare for the elements: Pack rashguards to wear when swimming; the water can be cold. Wear plenty of sunscreen and over-provision on water. Don’t consume anything from a faucet, including water, ice or washed produce. Don’t get dehydrated. Meredith Laitos started sailing competitively while in journalism school at Northwestern University. From there she moved to Boston where she spent five years sailing and writing for SAIL Magazine. She now lives in San Francisco where she is the Communications Director at the St. Francis Yacht Club.